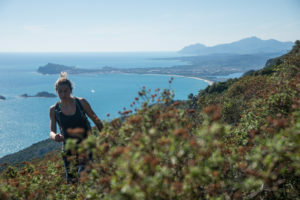 Trekking in Sardinia is simply fantastic, and the Ogliastra region offers some of the best and most varied walks on the island. From a simple stroll along the sand with the mountains in the background to “vie ferrata”-like walks, such as the traverse of the Gorroppu Gorge, to the Selvaggio Blu, Italy’s hardest trekking but very satisfying. Our aim in The Lemon House is to support our guests so that they can enjoy their walking holiday to the full. We offer logistic service for organizing the Selvaggio Blu trekking, this includes the organizing of the backpack, the logistic for the water, the knowledge of the rules etc. You can also choose to join organized groups, but that’s a different experience, more “accessible” and way more expensive. We started with UIAGM Mountain guides Matteo Piccardi and Stefano Vulcan a guiding company. We offer services for any level, starting from the easiest trekking to the hardest climb. In the recent years lots of new hiking guides have been published, so that the landscape, while remaining wild and unspoiled, is much more accessible to walkers than it once was. Before that Sardinia had the reputation of being very difficult for walking, with no tradition of “going for a walk” and only a few routes were waymarked. There were no networks of paths, like you find for example in the Alps. Some walks are now waymarked and described on walking maps prepared by the Regione Sardegna, and there is even this video in English to describe it! Many people start with the walks to Cala Goloritzè or to the Gola su Gorroppu, which are recommended in this Lonely Planet article. But there are many others! We can advise you which are the best and most interesting walks according to your experience and interests. We can lend you a GPS with route information for free. For older people as well and for families with kids there are suitable walks. We explain the routes and where you need to pay particularly attention. We can also arrange transport with RHIBs, for instance for the Selvaggio Blu or to walk from Cala Sisine to Cala Luna. We proudly have a small library with more than 15 guidebooks about trekking in the area, that are free to use for our guests, as well as all the IGM military maps (1:25000).